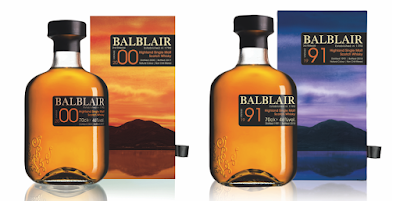 The Highland based Balblair distillery, has announced the launch of the second limited release of its 2000 Vintage and the third release of its 1991 Vintage. Balblair 2000 Vintage Second Edition (46% ABV) was matured in a combination of American oak and ex-bourbon casks for 13 years, before spending five years in first fill Spanish oak butts, and is said to be full-bodied with aromas of seasoned oak, baked red apples and fruitcake, followed by warming vanilla and ripe tropical stone fruits. Balblair 1991 Third Edition (46% ABV) was matured in a combination of American oak and ex-bourbon casks for 24 years, before spending three years in first fill Spanish oak butts, and is said to be expansive and complex with rich citrus fruits and vanilla notes as well as toffee and chocolate. Balblair 2000 Vintage Second Edition and Balblair 1991 Vintage Second Edition, will be available later this month from specialist retailers, for the respective RRP's of £70.00 and £125.00.